After a storm, damage caused by water can come from a number of sources. It is important that these issues are taken care of right away as to prevent further damage. This practice is referred to as Mitigation. 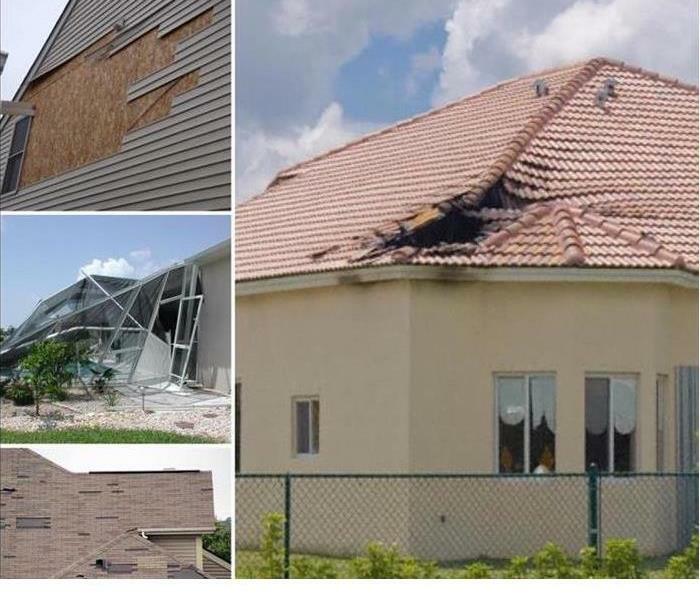 Professional restoration services are usually enlisted in preventing further damages to your West Palm Beach or Wellington home. If you have ever experienced a flood in your home, you know the severity of the potential damage. 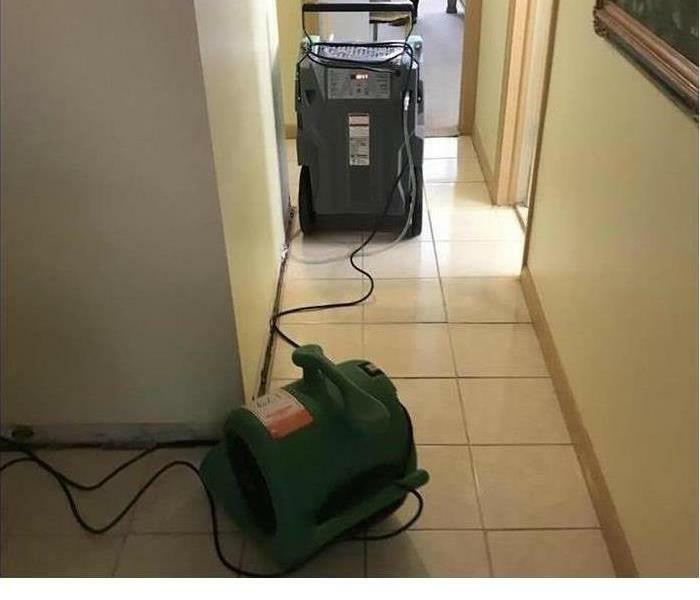 The water damage trained technicians at SERVPRO of West Palm Beach are highly versed in water damage restoration and are successful in making your home "Like it never even happened." We use professional grade equipment to get rid of mold, odors, and water. We also are able to detect hidden mold and moisture causing damage to your home. Our crew is IICRC certified and experienced, providing you a peace of mind when emergency disasters hit. How Does Mold Occur In Your West Palm Beach Home? Evidence of mold is everywhere. Mold spores are airborne, and once they find themselves in any area with adequate moisture they are able to quickly multiply themselves. As moisture and wet areas travel and spread so does mold, eventually affecting any area in its path. The rapid accumulation of mold infestations in a home or commercial building is reason enough to immediately act on any wet areas or building material. Water damage to a home or commercial building can be caused from natural or accidental disasters.When disaster strikes, not only is water extraction required but mold inspection and restoration as well. 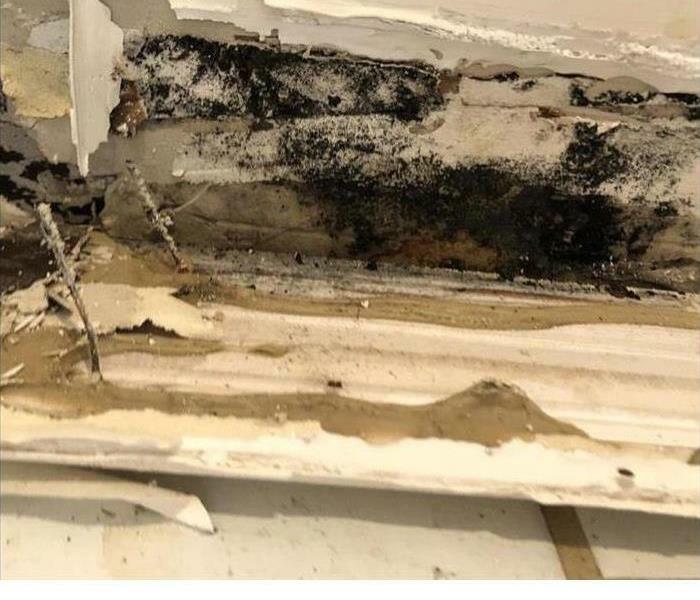 As mold removal products will not suffice in this case, call the mold experts at SERVPRO of West Palm Beach, (561)795-5410. When disaster strikes at a hospitality facility, the help of a specialized team is critical in assuring that normal operations resume as quickly and safely as possible. Whether the cause is a coat hanger on a sprinkler head, a fire, a traumatic event, or a natural disaster, count on SERVPRO of West Palm Beach. Our team will coordinate with your management and maintenance staff to prioritize spaces, isolate the damage, and restore the area to your complete satisfaction, while minimizing the inconvenience to you and your guests. Our technicians have had extensive experience in commercial damage and restoration whether it is mold, fire or water. Our professionals are available 24-7/365 to help remediate any damage, regardless of the cause, scale of the loss, or the size of your facility. 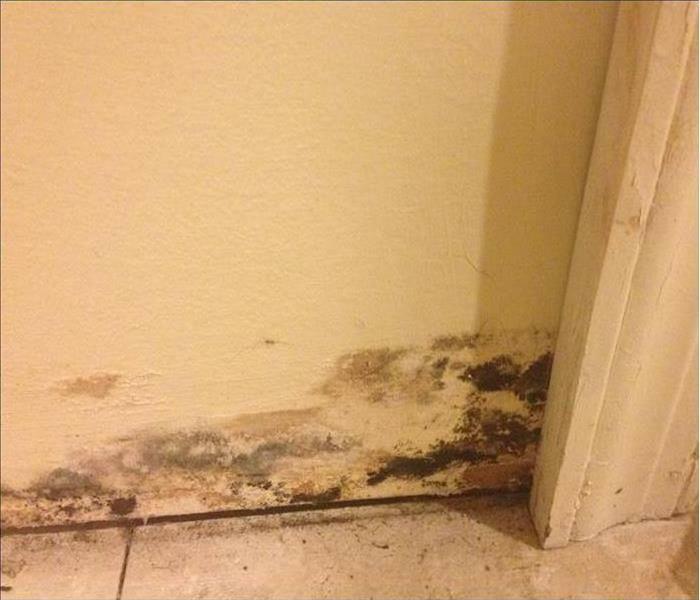 Chances are you've experienced some type of mold in your bathroom at least once. Sneaky and invasive, mold can show up at anytime in a bathroom. Although mold is a common problem, if it hasn't gotten out of hand and is not severe then, it's easy to prevent and get rid of. It's not surprising that mold thrives in dark and damp spaces, especially one like a bathroom after showering. If you are experiencing mold in your home too big for you to handle on your own and are in need of mold removal, give the pros at SERVPRO of West Palm Beach a call at (561)795-5410. We will be glad to inspect your home and perform any mold remediation. A small fire is capable of causing big damage to your West Palm Beach home. 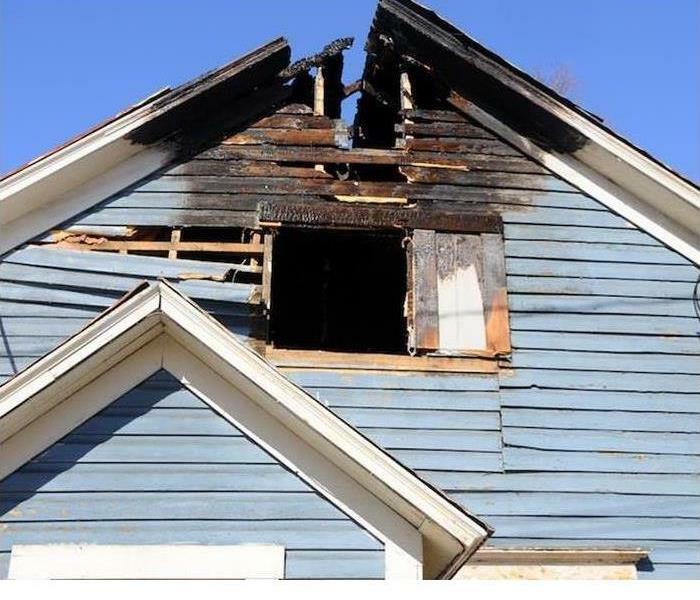 Fire repair and restoration that's done in a quick manner is key to preventing more damage from occurring to your home and potentially your health. On average smoke damage restoration could cost around $3,000. 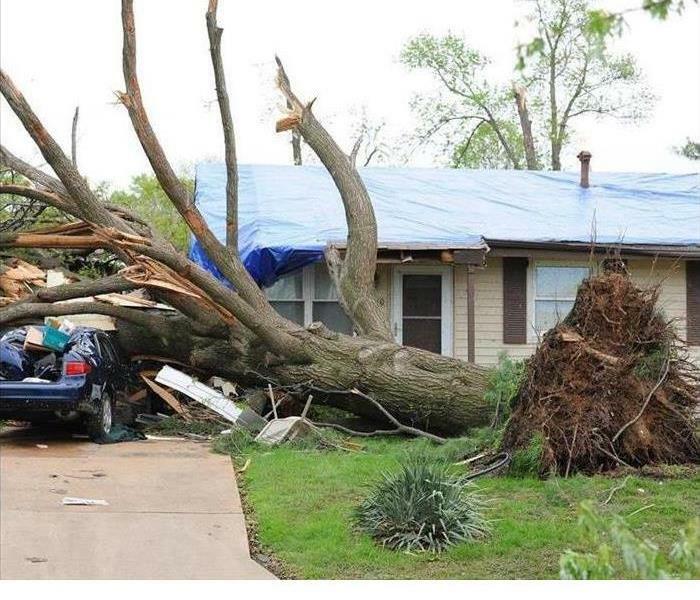 Factors like location and severity of the damage affect the price. A kitchen fire can often be more costly compared to a closet fire. However, homeowner's or renter's insurance along with calling in a professional restoration company in West Palm, can help to lessen out of pocket expenses. If you're experiencing smoke or soot damage call us at (561)795-5410 and our experienced technicians will be glad to walk you through the process of bringing your home back to normal. A furry friend fills your home with lots of love but it also fills it with lots of fur, messes and sometimes unwanted pet odors. 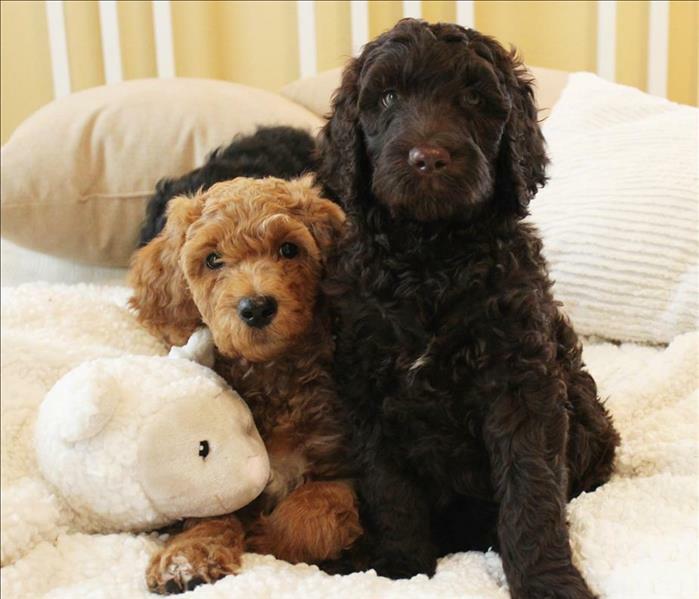 A study done by NCSU discovered that homes with dogs harbor more bacteria than those without dogs. It was also found that bed linens hold the most dog bacteria in your home. No worries, it's possible to co-habit with your furry friend without having your home smell like a dog hotel. If you have pet odors taking over your home, call the pros of SERVPRO of West Palm Beach at (561)795-5410 to professionally deep clean couches, carpets and other areas of your home that may need attention. 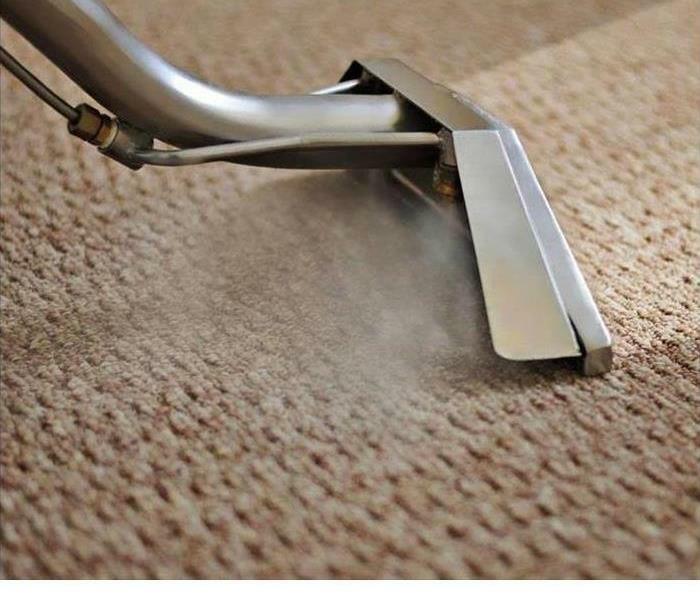 After a carpet experiences water damage, it's more than likely to have a musty odor left behind. Not only are musty carpets stinky but they could be a sign of mold as well. Although it may seem difficult to accomplish, finding the smell of mildew is a simple task. How Can You Protect Your Home From Water Damage? 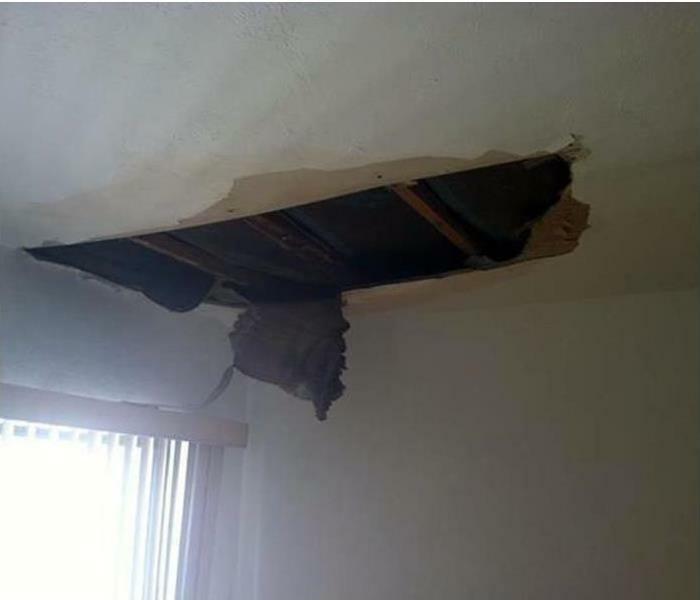 Being one of the most expensive disasters a home can experience, water damage is more common than you think. Protect your home and belongings with the insurance coverage that's right for you and by following the tips below. Inspect appliance hoses and faucets. When away on vacation, shut off the water supply to the washing machine. Store off-season and other bulk belongings in waterproof bins. Never store valuables or memorabilia where there is risk of destruction from water. 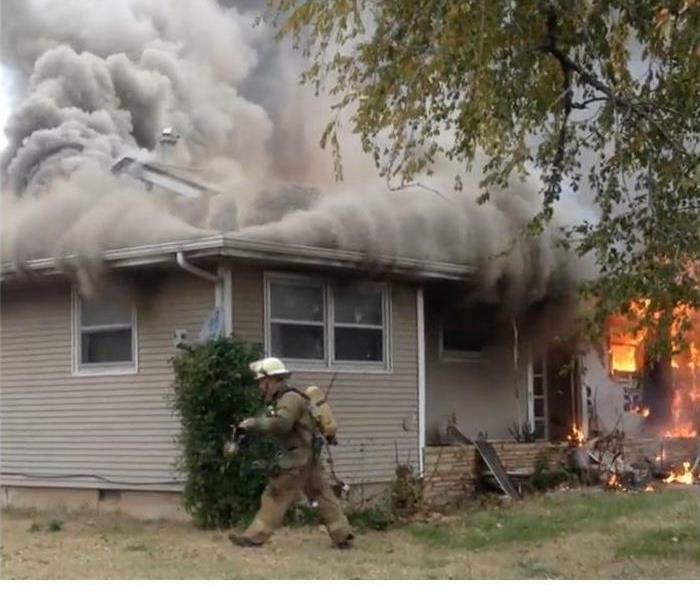 Fires can be devastating to your home. 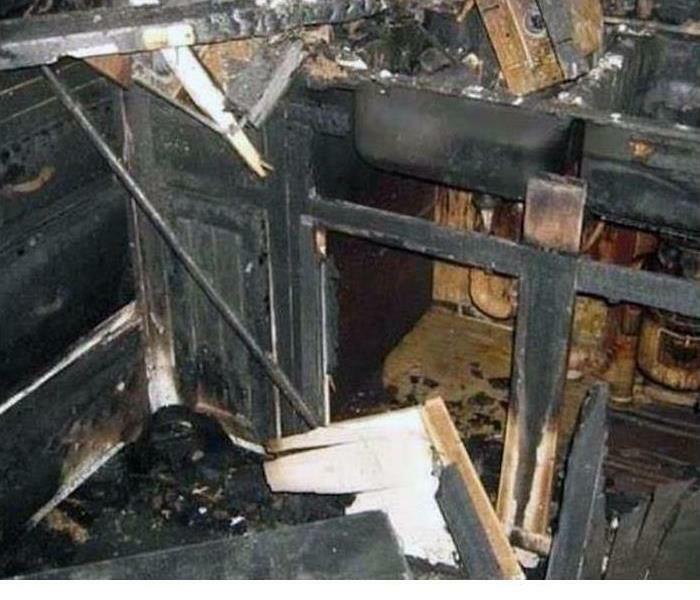 Even a small kitchen fire, can cause immense damage and cost thousands in repair. Fires can be caused by a spark, faulty wiring, or human error. With their home and personal belongings afflicted by soot and smoke damage, all hope may seem lost. 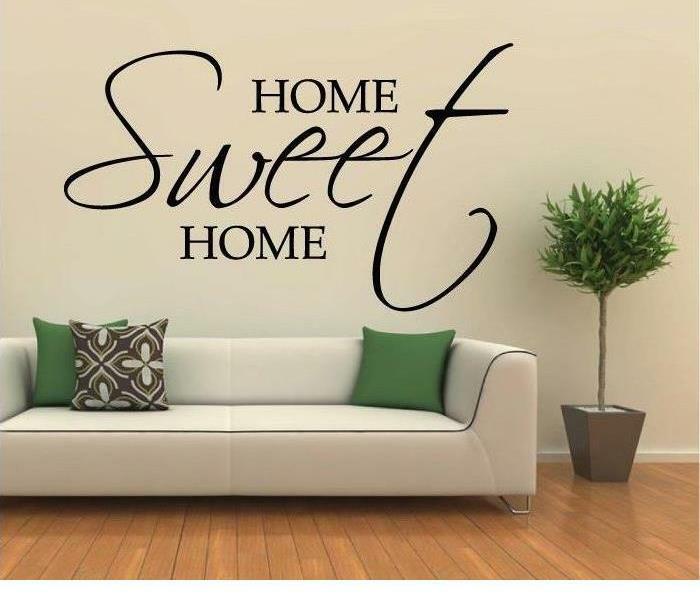 The crew at SERVPRO of West Palm Beach understand the significance of properly cleaning and repairing a home and it's items for West Palm Beach residents. 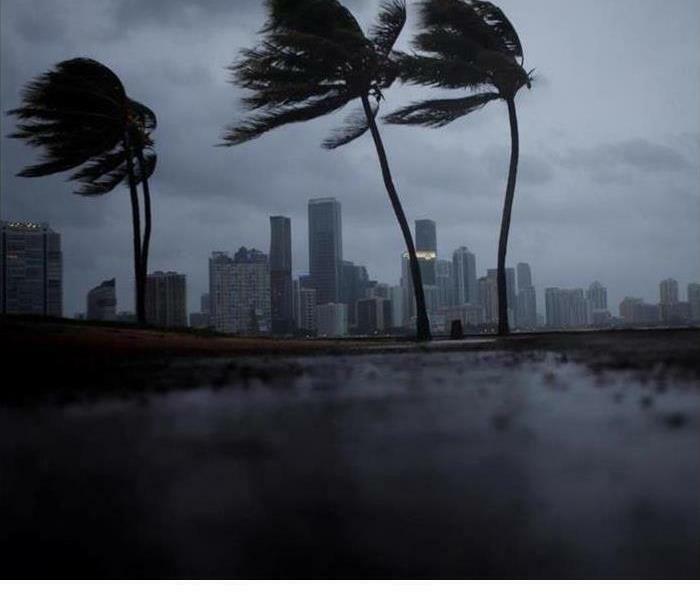 Any type of storm damage can be handled by SERVPRO of West Palm Beach, we are here to help. From water extraction, thorough cleaning, and even water damage restoration we have technicians who are IICRC certified and trained to look for signs of damage and where to begin on the cleaning process. SERVPRO of West Palm Beach will respond to your mold problem 24/7! Mold can grow quickly and spread just as quick becoming a nuisance for Palm Beach County home and building owners. Mold removal does not always have to be so daunting. 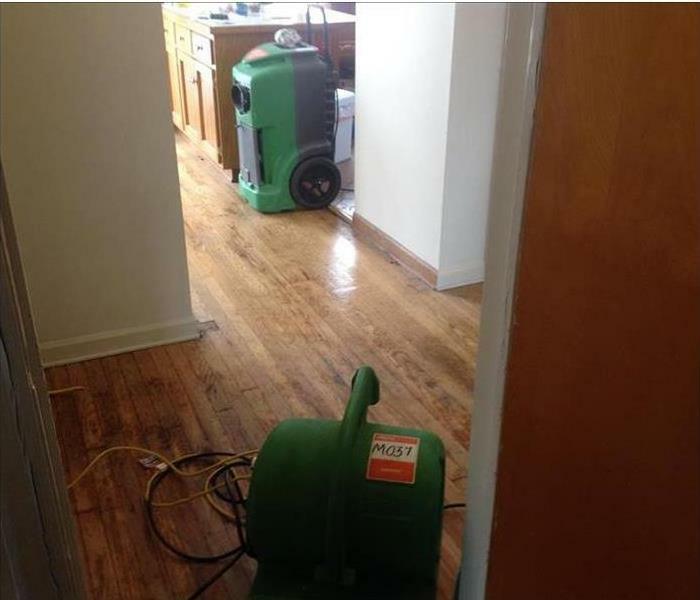 Let the experts at SERVPRO handle the job and use state of the art remediation technology? Call today for a mold inspection for your home or commercial building. Our specialized cleaning solutions made in Gallatin, TN can tackle any kind of commercial cleaning job! 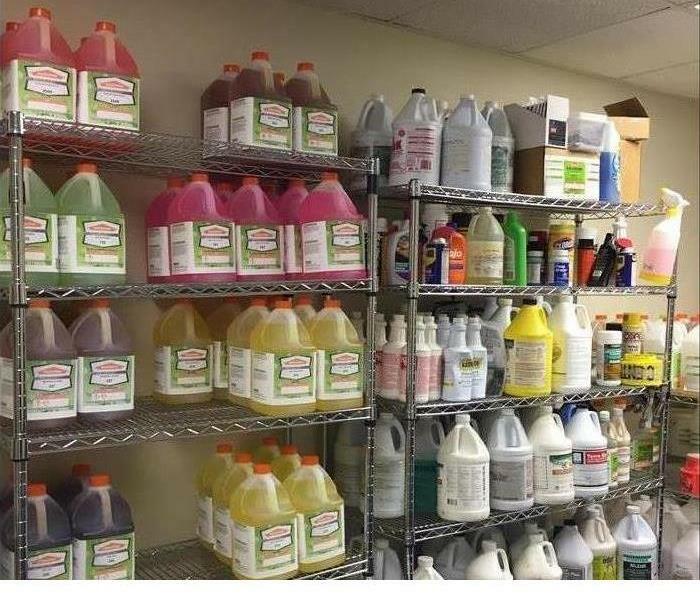 SERVPRO uses the industry leading cleaning formulas that no other restoration company has access to. It is with these formulas and our expert technicians' knowledge that make us the #1 choice for cleaning and restoration. SERVPRO of West Palm has had experience with commercial buildings and major clean ups. From mold to biohazard disasters, we'll make it "Like it never even happened." SERVPRO of West Palm Beach services many areas in Palm Beach County when it comes to fire, soot, and smoke damage. 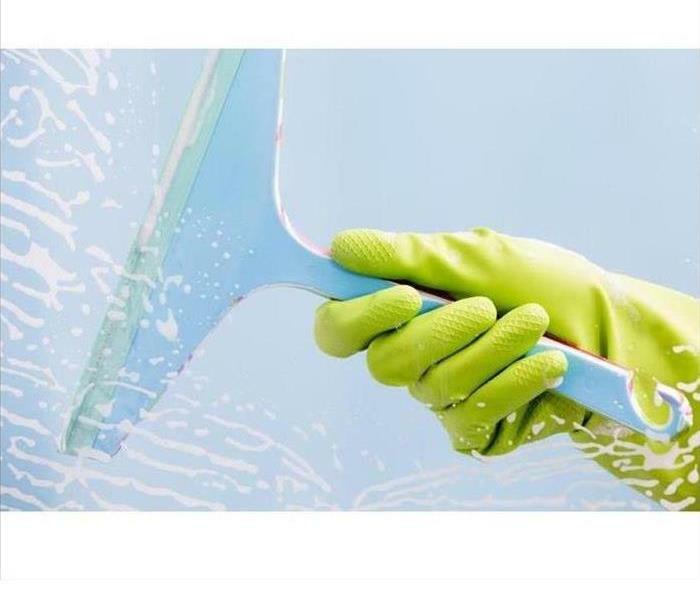 Royal Palm Beach, Loxahatchee Groves, Wellington, Palm Beach Island, Downtown West Palm and the surrounding areas all have access to the professional clean up and restoration of SERVPRO of West Palm Beach. Fire restoration to a home or commercial building is possible and a phone call away, 24/7! Pictured above is a living room affected by water damage after a storm hit in West Palm Beach, Florida. The baseboards incurred a great amount of damage, leaving the entire area to be removed and rebuilt. 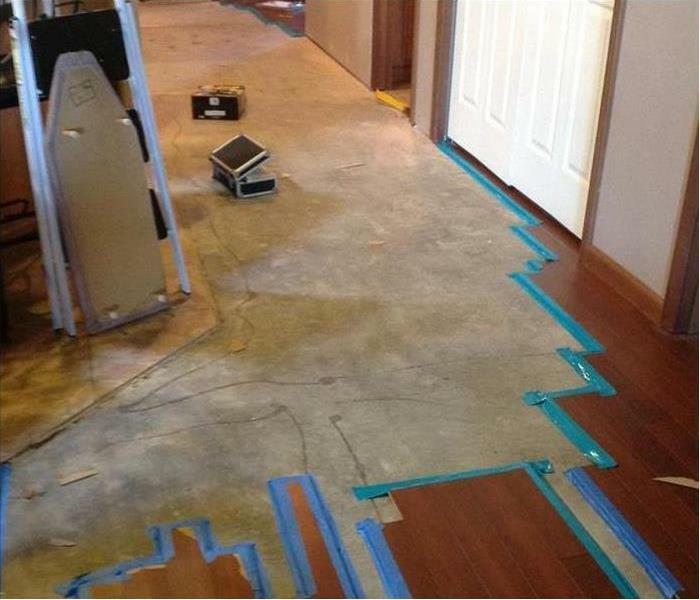 This homeowner was pleased with the way the SERVPRO team efficiently handled the loss. Our certified technicians worked quickly and diligently to cleanup, inspect, and rebuild her baseboards. When cleaning and inspecting, our team searched for any more signs of a water leak or needed water extraction. Evidence of mold and mildew was also sought after as is typical of water damage cases. Mold growth takes as little as 48 hours to grow and fester with the right conditions. 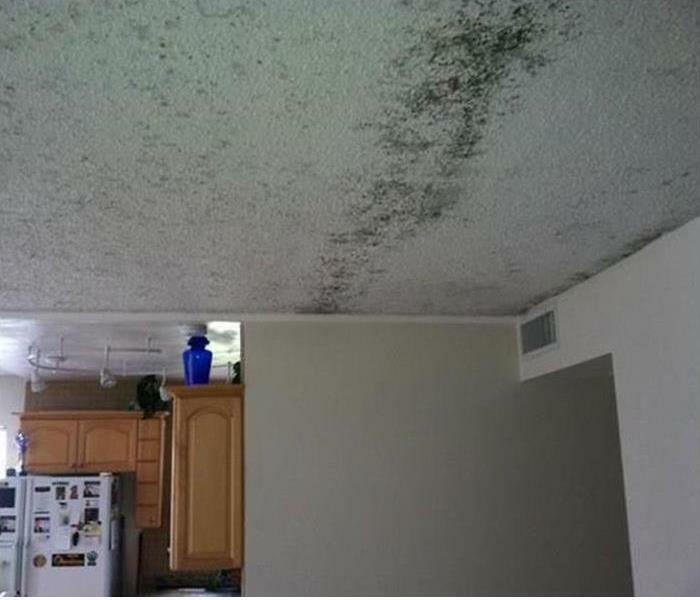 Often times in South Florida homes, water damage or trapped moisture that goes untreated will lead to mold. 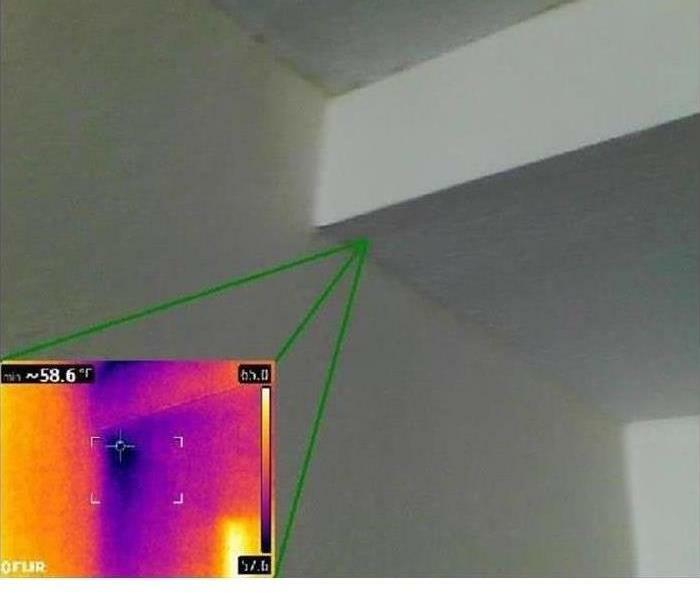 Water and moisture hiding behind baseboards, cabinets, and inside drywall mixed with South Florida's humidity creates the perfect breeding ground for mold. Make sure to call SERVPRO of West Palm Beach immediately upon on notice of any leaks, pooling of water, or damage by sources of water and moisture. SERVPRO of West Palm Beach uses industry leading technology to identify hidden water in your home after a storm. Often water extraction is needed to take place beneath the visible surfaces, requiring special equipment that pinpoints the moisture. Areas that have made contact with storm inflicted damage to homes and commercial buildings, will then be assessed as to the extent of damage, dried, and provided rebuild if necessary. SERVPRO's team services Royal Palm Beach, Wellington, Downtown West Palm Beach, Palm Beach Island and many more surrounding areas. Call an expert water extraction company like SERVPRO of West Palm Beach. Burned furniture, singed articles, soot covered walls and counters are not the only effects of a fire on a Palm Beach County home. Homeowners at first glance following a disaster believe rebuilding or cleaning and salvaging any personal belongings are the main focuses. 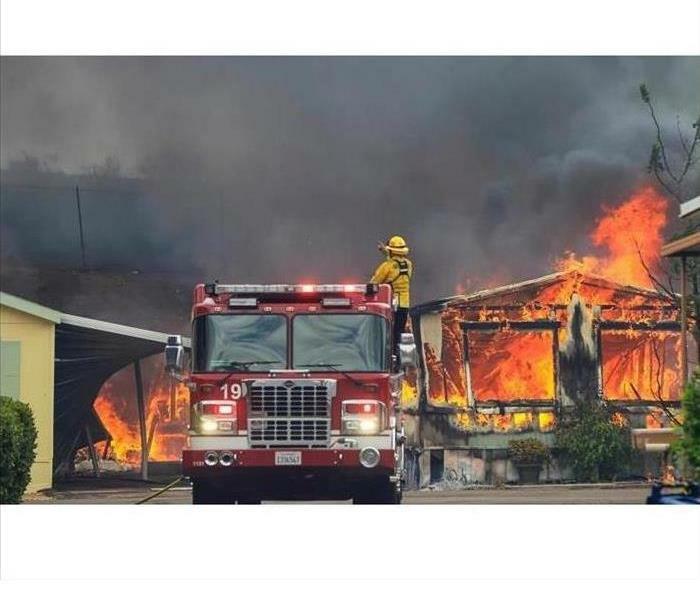 However many people fail to account for water damage related to the fire. Sprinkler systems or water from the firefighting efforts can cause a sufficient amount of damage to a home during a fire. A professional restoration company in West Palm Beach, would assess both fire and water cleanup efforts. Considering both can be the difference between a safe, salvaged, healthy home and an expensive, potentially hazardous environment causing long-term damage. Our 3rd annual Christmas party at SERVPRO of West Palm Beach was a great success! 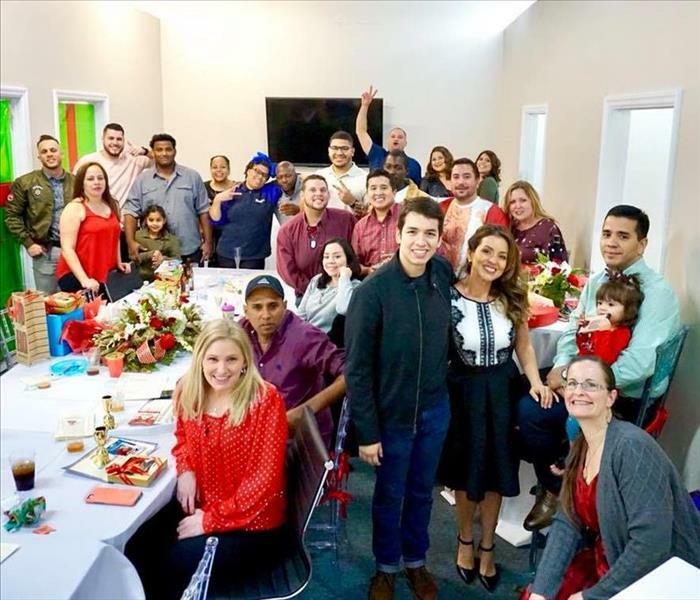 Our employees gathered together with family and friends to celebrate another wonderful year at SERVPRO of West Palm Beach. We believe in community, loyalty and professionalism and our SERVPRO has done above and beyond this past year! Thank you to the Palm Beach community for supporting us and choosing us for your disaster and cleanup needs! The disadvantage to a laminate flooring in a West Palm Beach home is the susceptibility to water damage--not like ceramic or porcelain tile. 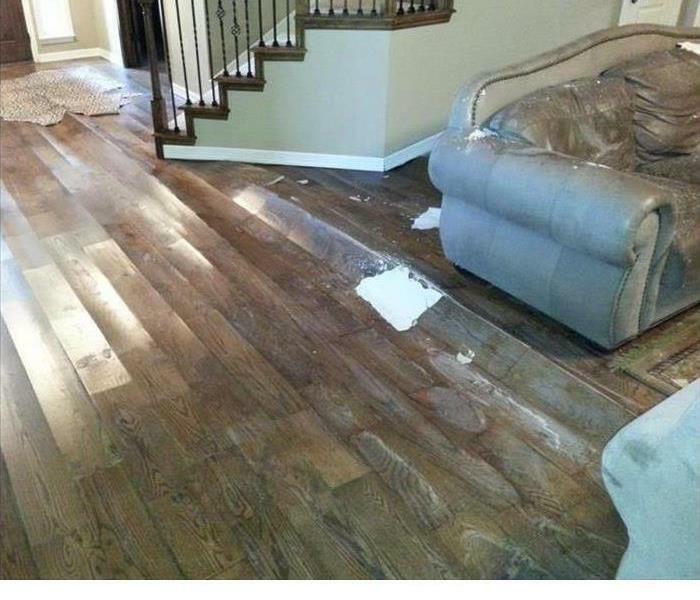 SERVPRO team members can extract the water quickly to salvage as much of this flooring as possible. We're Faster To Any Size Disaster. 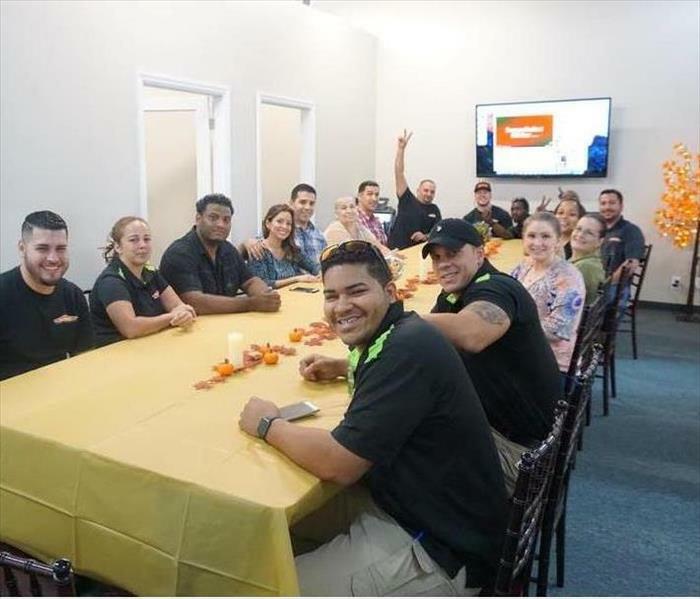 SERVPRO of West Palm Beach hosted a beautiful Thanksgiving for their employees this past Thursday. Everyone got together to share a meal and time together as a work family and share what they were thankful for this past year. The food was delicious and the time was great. At SERVPRO of West Palm Beach, we are thankful for both our customers and our employees! 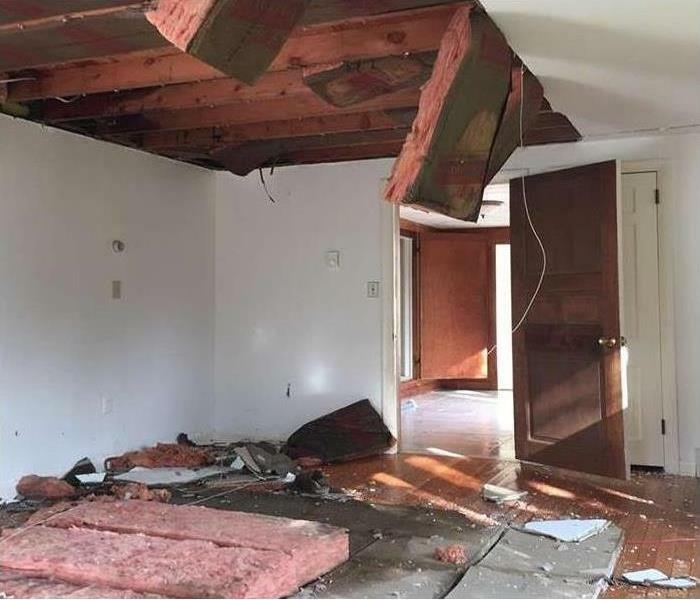 The partially demolished ceiling in this Royal Palm Beach home ensured the safety of our SERVPRO technicians as it was also the first cleanup step. 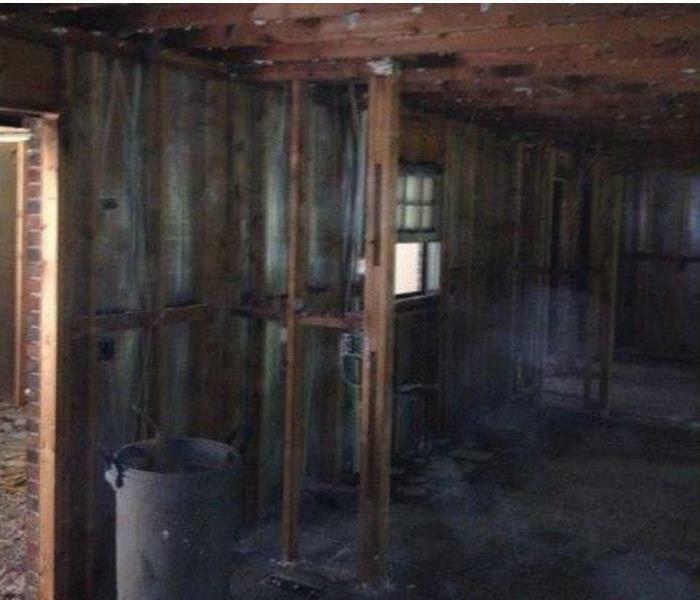 The ruined drywall panels were carefully set on the hardwood floor, not seen is a tarp as a protective barrier. The roof was also closed with several sheets of plywood to keep out the bad weather. 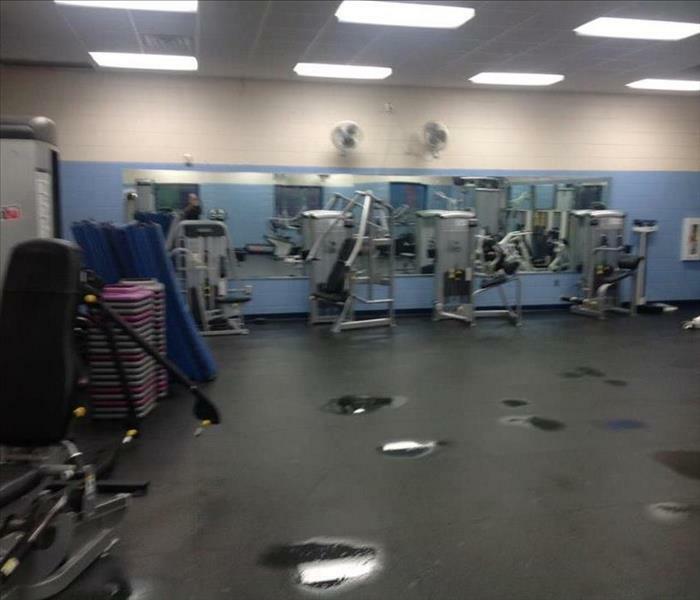 The broken line flooded the rubberized floor of this West Palm Beach workout center with some pooling water. The water removal, done swiftly, prevented any rusting or degradation to the exercise equipment. Dehumidifiers rapidly restored the RH relative humidity to comfortable levels. The disruption was minimal since the restoration was completed during the night. The water was removed from the kitchen leak in this Palm Beach house before the drying equipment did their job. The air movers and dehumidifiers removed the remaining excess moisture to restore standard levels of humidity. The smoke residue from this small fire in a West Palm Beach condo was wiped up with sponges and detergents by our SERVPRO technician. 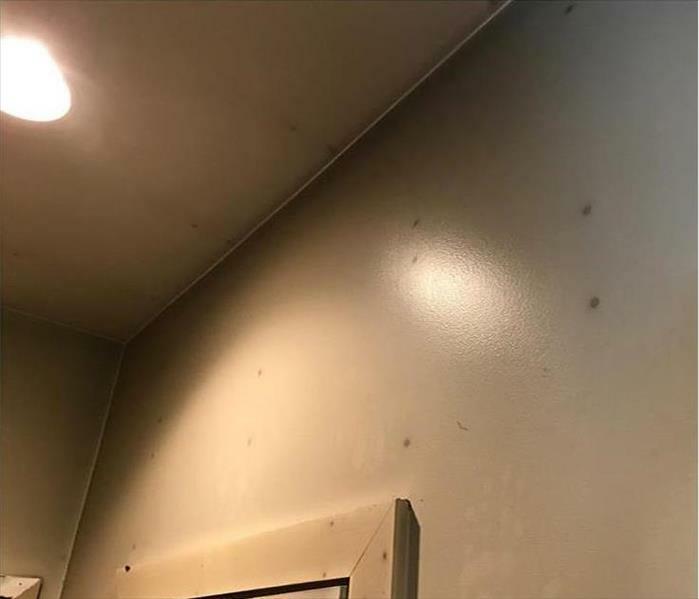 The black spots resulted from metal nail heads that heated up and damaged the drywall. They did not pop through to the outer surface, so the visible damage is restorable. 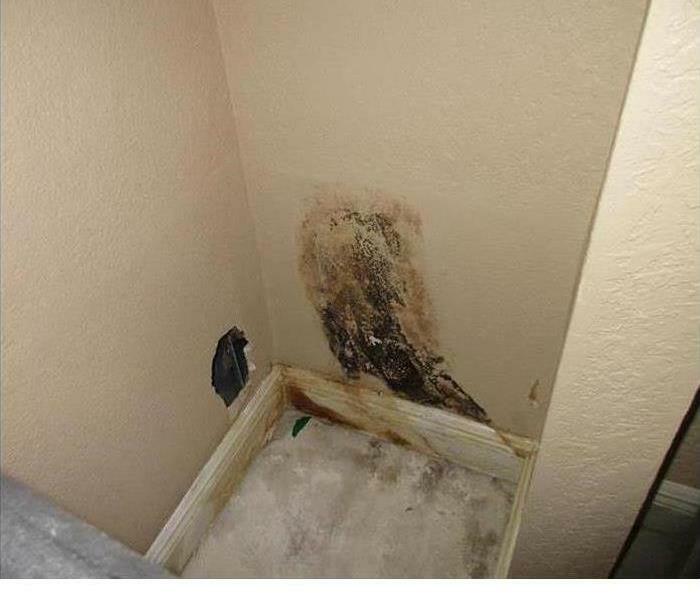 Moisture from a small leak led to a mold colony growing and staining the wall in this Royal Palm Beach property. The drywall was crumbling and needed a partial replacement. Fixing the bathroom leak from the opposing side of the wall was needed to prevent the same problem from occurring in the future. 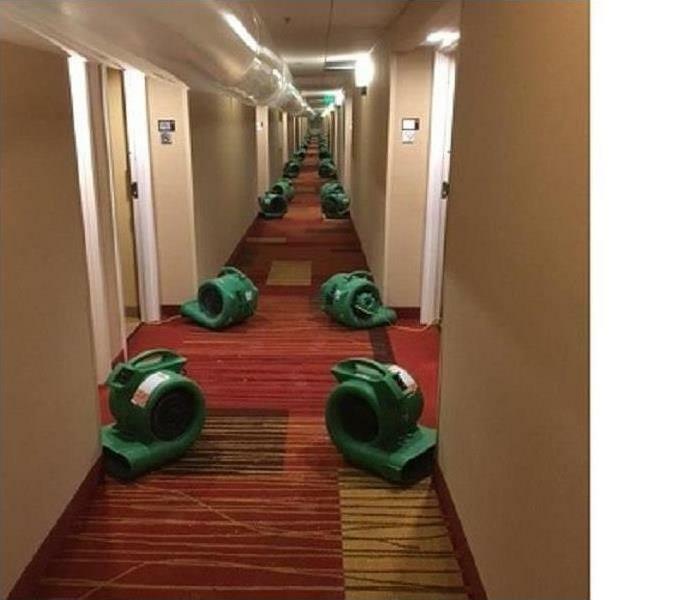 The sprinkler system activated and ran long enough to douse the carpeting in the hallway of this hotel in West Palm Beach. 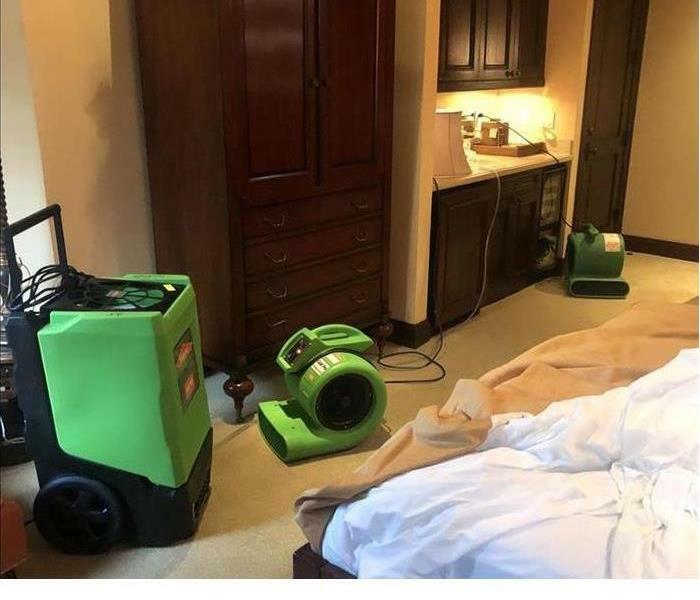 Using air movers, dehumidifiers, and tubing, we quickly captured the excess moisture and soon had the rooms available for their guests. 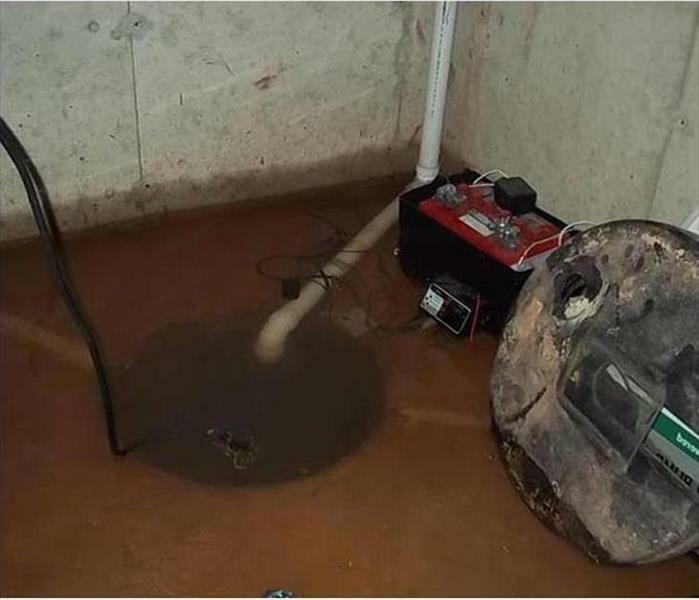 The sump pump broke down allowing storm water to cover this sublevel room with several inches of water. We set up a portable pump to extract the bulk of the water to mitigate the water damage. We then followed up with drying techniques to reduce the humidity. The mold was spread out through this popcorned ceiling in this West Palm Beach home. The HVAC system leaked cool air which led to condensation in the attic. We cleaned and serviced the ducts before we could move on to remediating the mold growth. The fire damage clean up was an integral part of this restoration service. We discarded a lot of building materials from this home. We set up ozone machines to improve the very poor air quality following this flameout. The soaked ceiling from a water heater in the attic needed some demolition and cleanup before we could dry out the damaged water areas. It was essential for complete drying to reduce the chance of mold growth in the attic.